Attention conservation notice: this doesn’t have much to do with MMOs. 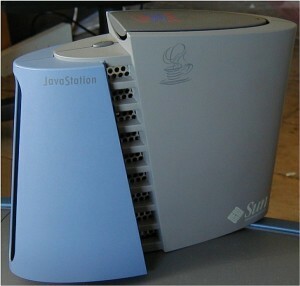 A decade or so ago, I worked on Sun’s internal JavaStation deployment project. Our mandate was to deploy a few thousand of these things throughout Sun as replacement desktops. It was a lot of fun, I learned a lot, and I got to travel some. I think that was my first business travel, in fact. The retail cost of a JavaStation-10 was around $750, if I recall correctly. It was a great concept, because it was a great task station. You could do email, calendaring, and Web browsing. The OS was slower than you’d like, but I found it perfectly reasonable unless you were asking it to do X-Windows via Citrix or something like that. Of course, you had to have a big chunky server in the data center to serve up the OS at boot time, and the hardware didn’t include the mythical JavaChip co-processor, so complex apps could be a bit poky. A decade later, I have an iPad sitting on my desk. It ran me around $750, but I could have gotten one at two-thirds the price. It does email, calendaring, and Web browsing, plus a ton more. The OS is fast. This would make a really good task station, especially if you housed it in a different casing and slapped on a keyboard. I have no reason to think that Apple is aiming in that direction, but I won’t be surprised if we see iOS devices designed for single purpose workstations. Those early ideas just get better and better as the technology catches up, huh? In a vain attempt to tie this back to the blog purpose: this thing is going to be an amazing admin tool. If I’m in the datacenter, it’ll be very useful to have a separate screen handy. I can’t count the number of times I’ve been looking at a server on a KVM and I’ve wanted to have a second monitor available for watching logs and so forth. I have an ssh client, and I have a client that does both RDP and VNC, which is key for a multi-platform admin. If I was still working in Silicon Valley back in the stupid money days, I’d try to sell my boss on buying these for my team as core tools. Cheaper than an on-call laptop. Have you read Seth Godin on iPad killer meeting app? Now if someone would just write such a thing. Man, both of those ideas would be completely awesome. I think he’s got a handle on one of the iPad sweet spots — actually, it’s a tablet sweet spot, it’s not iPad specific. Focused information exchange.